The first day as a new legislator is a lot like the first day of college, said Senate Minority Leader J.B. Jennings, from Baltimore County. Republican Gov. Larry Hogan welcomed lawmakers — both new and returning — with promises of bipartisanship and cooperation. 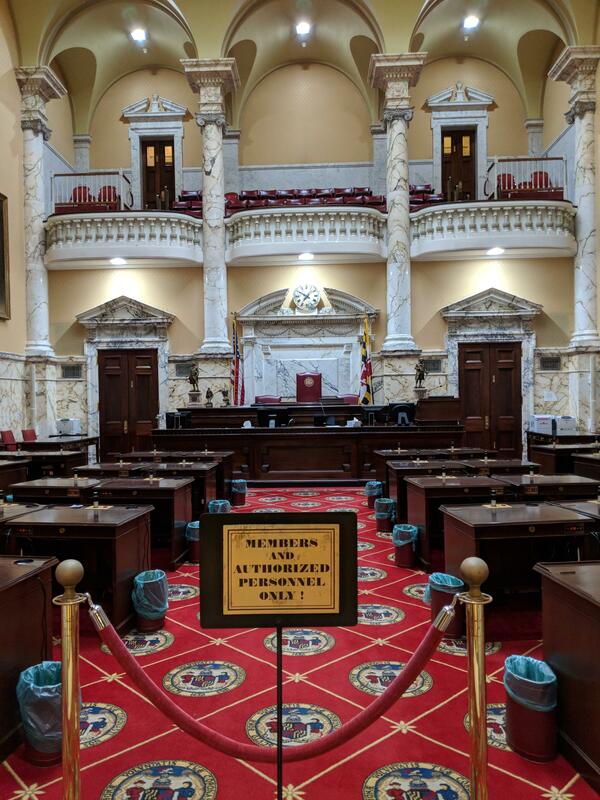 “All of us want to start the session off in good faith, work together with all of you on both sides of the aisle to come up with real, bipartisan, commonsense solutions,” Hogan said. For Sen. Bill Ferguson, a Baltimore Democrat, the new class of legislators means he can pass the baton as the youngest member of the Senate. Ferguson, who is 35, presented Elfreth, who’s 30, with a small trophy. But it wasn’t everyone’s first day. The chamber elected Miller Senate President for the 33rd straight year — the longest serving senate president in the country. Miller, in turn, promised a productive 90 days. “We’re going to fight for education, health care, the environment, prescription drugs, insurance reform — we got a lot of positive things happening,” he said. But all that work can wait for day two, he said, after everyone’s gotten settled. With the General Assembly about to get underway, Baltimore County has high hopes of receiving hundreds of millions of dollars from the state for school construction. And for the first time since his December inauguration, Baltimore County Executive Johnny Olszewski spoke with Governor Hogan about the county's schools. WYPR’s John Lee joined Morning Edition host Nathan Sterner in the studio to talk about the need for the money and the prospects of the county getting it.